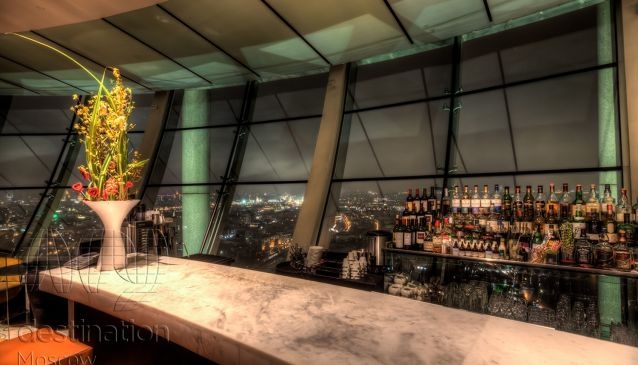 The panoramic City Space Bar is a cocktail bar certainly worth visiting, even if only once in a lifetime, thanks to its stunning views of the city. Located on the 34th floor of Swissôtel Krasnye Holmy, Moscow, City Space literally soars over the city at a height of 140 meters. Inside, the bar is like a classic flying saucer with a 360-degree view. The bar opens at 17.00, so Moscow can always be seen in its most attractive light - literally at sunset, and figuratively thanks to the flickering fireworks of the city at night. City Space Bar is also unique for its variety of cocktails: cold or hot, classic or molecular. City Space was included on the 'World's 50 Best Bars 2011' list by Drinks International magazine. If you visit City Space Bar you will have not only a pleasant evening in a very comfortable place with fantastic scene from the window but also you will get a kind of a 'Dining experience' by trying new delicious tastes and flavors. Due to the breathtaking panoramic views, excellent cuisine and genuine Swiss service City Space Bar has become a perfect venue for a business meeting, romantic dinner or casual get together. Famous foreign bartenders come to City Space Bar to make their signature cocktails monthly.